The Vauxhall Cavalier and the Saab 9000. Two red, ‘90s saloons that couldn’t be more different. 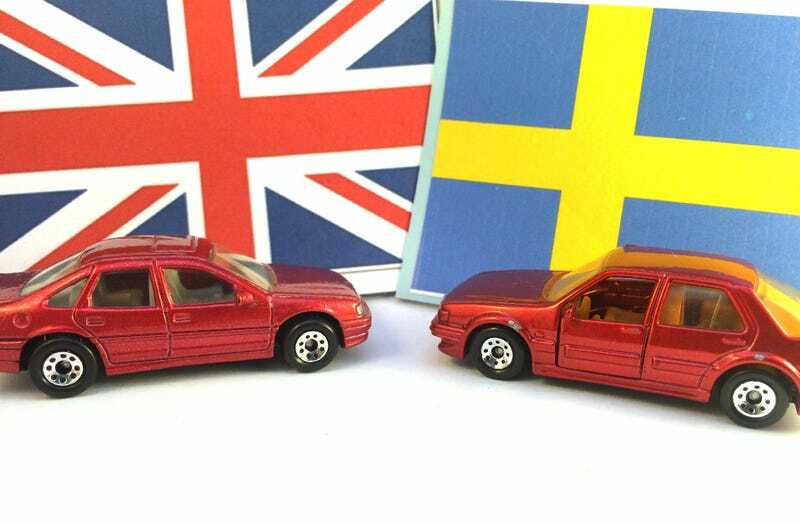 One is a dowdy British family sedan with German roots that came with a parts-bin four cylinder, and the other is Sweden’s sauciest hatchback on an Italian platform with some of the mightiest turbo-fours ever. Rectangular as they may be, the Saab undeniably has a bit more flair in its crisped and crimped lines as opposed to the bathtub corners on the Vauxhall. Round the back it seems that Matchbox took a different approach to assembling the Vectra with a large black plastic tab as the rear fascia unlike the nib as the license plate of the Saab. So of these two great (?) sedans of England (?) and Sweden, which do you think had a greater overall impact on the future of Saab given the technological powerhouse that the 9000 was? Why, the Vauxhall/Opel of course! The 9000 was great at many things but the thing it did best was bankrupt Saab; thus, all subsequent cars were built off of the Vectra’s GM2900 Platform! That’s a story that’s been told, though, so for today let’s just appreciate how this quintessentially British nameplate became linked to Sweden’s sports brand through a very unlikely GM deal. Thanks for looking, and thank goodness tomorrow’s Friday!